One of Australia’s best-known home services brands, Dodo is a subsidiary of Vocus Communications which also owns another popular broadband provider, iPrimus, among many other companies. Dodo provides not just home internet and mobile phone plans, but also comprehensive insurance and home energy products, making Dodo a standout amongst the competition, with the ability to provide all of a household’s key services on one monthly bill. Broadband internet is nevertheless Dodo’s core business, offering a comprehensive range of ADSL2+, NBN and mobile internet services. With several unique entertainment bundles available in addition to standard internet-only plans, Dodo offers a product to suit almost every household. Dodo also provides some of the cheapest broadband plans around. We’ve looked into the details of Dodo’s internet plans to give you a rundown of exactly what they offer – and how they stack up next to the competition. Is Dodo best for you, or could another provider offer you a superior deal? Read on to find out. 24 months – no setup or modem fees. 12 months – no setup or modem fees. Month-to-month – $109 modem fee, $99 setup fee. What features does Dodo offer? Dodo NBN coverage is largely subject to the rollout by NBN’s wholesale company, NBN Co, as well as Dodo’s parent Vocus Communications. 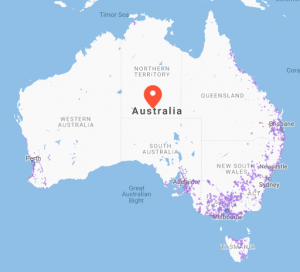 Dodo’s NBN coverage spans across most capital cities, as well as the Hume highway corridor between Sydney and Melbourne, covering the smaller towns roughly along this line. On Dodo’s website there is an address checker, so you can find out if you’re covered and what type of connection you can expect if you aren’t currently connected. Dodo offers more than just broadband – there is a lot of extra ‘stuff’ that can be added on in the purchasing process. Dodo boasts entertainment, call packs and more. Entertainment: For $15-$20 a month extra you can get either a Fetch Mini or a Fetch Mighty player by Fetch TV. From there you can add on channel packs and other premium content. Call Packs: NBN fibre plans can be had with PAYG rates, with optional call packs able to be added on after, with VoIP available from $4.90 a month extra. Modems: A modem is included on 24 month plans, costs $50 on 12 month plans and $109 on month-to-month plans. Dodo is not just a barebones NBN provider and can offer internet, entertainment, home phone call packs and more. For the most part these are optional add-ons, so you can tailor your plan to suit your needs. As mentioned, Dodo offers a simple suite of NBN plans. There are two data points – unlimited or 101GB. From there you can choose your speed – Standard or Standard Plus – perhaps confusingly called ‘Turbo’ and ‘Supercharged’ respectively. Then you can choose your contract, with 24 month plans attracting no setup fee, 12 month plans attracting a $109 total setup fee and month-to-month plans attracting a $208 total setup fee. A common theme among telcos these days is to skip this speed tier and go straight to NBN 50, but not so for Dodo. Dodo offers 101GB of monthly data, and claims a 24Mbps busy period speed. Now to the most popular speed tier, Dodo’s ‘Supercharged’ plans are available from $70 per month, plus any setup fees if you’re on a 12 month or month-to-month plan. Dodo claims a 46Mbps busy period download speed here. Dodo has a suite of customer service options, including online chat and phone support, as well as kiosks throughout shopping centres in Australia. Apart from that, Dodo also has a webmail service, the ability to add a static IP and more. The online user portal also allows you to access your data usage, billing information and other details. How does Dodo broadband compare to other providers? Dodo is also not the only provider to bundle in Fetch TV packs, with iiNet, Internode, Optus and iPrimus also offering bundles at various prices. For straightforward NBN, Dodo does have one of the cheaper suites of plans, but may not be the cheapest. Should I get Dodo broadband internet? Dodo’s offerings consist of a comprehensive suite of both ADSL and NBN plans, which have the flexibility and low entry prices to cater to the needs of many Aussie households. While Dodo has very cheap entry prices, the fact is that monthly costs can skyrocket with adding on home phone and calling packs, as well as entertainment bundles. While the advertised costs seem low, it’s only upon looking into other costs that the overall picture can change. Dodo has flipped the bird to many other providers by offering some of the cheapest unlimited plans in Australia. The inclusion of entertainment hardware bundles is a unique selling point which is also likely to appeal to many customers. However, there could be a lot of potential periphery costs associated with your broadband bundle. It pays to have a look at the Critical Information Summaries of each plan to get a better cost analysis. Apart from that, it can pay to compare a range of different service providers, even if their apparent monthly plans are higher in price. What do customers think about Dodo NBN plans?